An eccentric up-and-comer who stands out even among the crowded Atlanta scene, Lil Wop demands attention with his off-kilter delivery. Dropping a fun-sized treat for the heads on 4/20, Wop delivers Wake-N-Bake, his latest mixtape. Though it boasts production from Zaytoven on the opening track, the tape is a showcase of the chemistry between Wop and his frequent collaborator Samba Beatz. In contrast to the sinister, bombastic sound of most trap music, Samba and Wop’s collaborations vibrate with joy, with the producer providing candy-colored synths for Wop to paint over with his rhymes. Featuring appearances from Famous Dex, Malachie Warren, Duwap Kaine, Cocaine P, and CubanDoll, Wake-N-Bake is an ideal soundtrack for an early morning smoke session. A devotee of Gucci Mane, who inspired Wop’s name and the ice cream tattoo on his left cheek, Lil Wop is a rising talent in the bustling Atlanta trap scene. Born and raised in Chicago, Wop moved to Atlanta to make a name for himself in the music industry. Earlier this week, Wop shared “Gotcho Bit#h,” the opening track on Wake-N-Bake. Featuring an appearance from Wop’s cousin Famous Dex and production from ATL sound architect Zaytoven, the XXL–premiered single is a suitably raucous way to kick off the mixtape. “Gotcho Bit#h” followed the release of Wake-N-Bake bonus track “Bombay,” ft. Cuban Doll, which capitalized on Lil Wop’s successful SXSW and garnered over 73,000 streams on SoundCloud in two weeks. 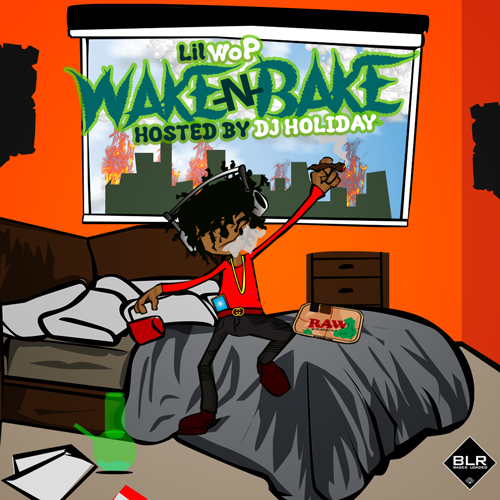 Hosted by DJ Holiday, Wake-N-Bake is available to download at LiveMixtapes.